For romesco sauce: In a small skillet, toast almonds over medium heat, stirring often until lightly golden, about 3 minutes. Toast bread in toaster until deeply golden; trim and discard crusts. Tear into pieces and cool slightly. In a mini food processor, combine almonds and bread; process to fine crumbs. Add roasted peppers and vinegar; process until smooth. Transfer to a small bowl. Bring steak to room temperature before grilling. Season generously with salt and black pepper. Prepare a gas or charcoal grill for direct cooking over medium-high heat. Oil the grill rack; add steak. Grill, covered, 2 to 3 minutes. Turn and grill 2 to 3 minutes more or until internal temperature reaches 145 degrees for medium-rare. (If using flank steak, grill 5 to 6 minutes on each side.) Transfer to a platter; let rest 10 minutes. Brush one side of baguette slices with oil. Place oiled sides down on rack and grill, covered, directly over medium heat until toasted, 1 to 2 minutes. Transfer to a platter, toasted sides up. Rub toasted sides with the halved garlic clove, then sprinkle with salt. Thinly slice steak across the grain. 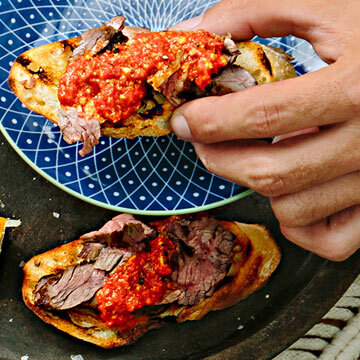 Top each baguette slice with a bit of steak and a dollop of romesco.